Bread Alone Bakery-Made By Hand, Each and Every day! Everyone love our bread the we serve at Aroma Thyme. We use a 100% whole wheat bread from Bread Alone Bakery. Bread Alone - an Organic European-style bakery serving New York's Hudson Valley.Bread Alone has been baking with organic flours since 1983 and has always been conscious of the quality of our ingredients. With a growing concern about the source of food, they have worked to make their hand made breads and pastries contain even more locally grown products. Their flour is milled in Quebec by Lily Vallières and Robert Beauchemin of La Meunerie Milanaise, who have been producing high quality organic flours since 1977. Many of Bread Alone's dairy products are from Boice Brothers Dairy in Kingston and eggs are from Feather Ridge Farm in Elizaville.Butter is from Cabot Dairy in Vermont, and much of our fruit is from local orchards and fields, which we can and freeze during the summer months. Bread Alone believe in hand-crafted breads that contain little more than grains, water and salt, and we have been baking with organic flours since we opened in 1983. 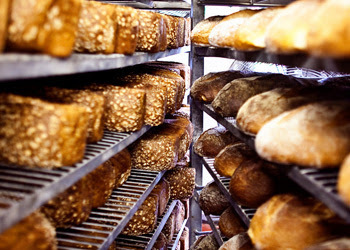 They bake and deliver fresh bread seven days a week to cafes, farmers’ markets and grocery stores throughout the Hudson Valley and New York City. A richly flavored classic golden crumb French loaf. A rich, buttery French specialty loaf. A classic Jewish braided egg bread. A bubbly crumb and flavorful Italian flatbread. An open-crumb Italian flat bread. An Italian flatbread infused with herbs, studded with green olives and topped with roasted onions. A traditional French style sourdough blending organic white and organic whole wheat flour. We gathered whole grains and mixed them with organic flour to make a bread that tastes of the first harvest. A healthy mix of organic whole grains and seeds. Our Organic French Sourdough studded walnuts and raisins. A light deliciously sour bread in the West Coast tradition. Bread Alone’s traditional Jewish Rye bread is a balance of sour and rye flavors. A honey and whole wheat loaf filled with seeds and whole grains. A simple one hundred percent whole wheat sandwich bread. A yeast free whole wheat sourdough with a moist, dense crumb. A low gluten bread that boasts a slight nutty flavor. A simple country-style white bread reminiscent of the breads of pastoral France and Northern Italy. Reminiscent of the breads of southern Italy made from durum wheat flour.